before I even thought to articulate it. focus on nothing more than, well, bathing. window that lets in a little sunshine. think of nothing else but the moment. And suddenly, for a while at least, everything in right in the world. spatula), adding the butter slowly, bit by bit. to detract too much from these incredible eggs. stirring. Keep the heat low. Add the butter slowly, lazily. Do not rush. your bread, or get the milk out of the fridge. custard. Keep stirring. Focus on the eggs. Live in this moment. It’s scrambled egg Zen. you (I) saw Daniel Craig pales in comparison. rightly. And if you let them. Those look delicious, a little bit of fresh scrambled eggs with [with a hint of parsley on top] is really a great way to start a morning. Those look perfect and creamy! I love scrambled eggs. Ever since my husband started making scrambled eggs for me with this method (and using farm pastured eggs), all other scrambled eggs pale in comparison. He also adds a dollop of creme fraiche (or sour cream) at the end and tops with a sprinkle of chives. Heavenly. I'm requesting them this Saturday morning! Beautiful in the moment thoughts. Thank you Joey! Looks delicious. I'm with the comments — topping with parsley and some chives… yum. Also, serving with bacon is a must… perhaps.. even mix in some bacon bits in the end? 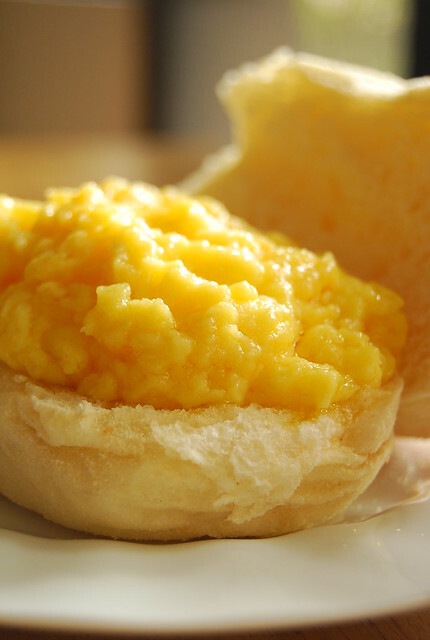 Oh butter with scrambled eggs sound so divine! 🙂 I have a "pause" moment, too. On the train, with my book. it's a moment that work and housework cannot get involved! I was reading Julia Child's My Life in France a few weeks ago and your entry sparked a memory of the chapter where the mentor at the Cordon Bleu was teaching her how to make proper scrambled eggs. It's a truly comforting dish and, when done as gorgeously simple as yours, it's just sublime. i love eggs w/ toast!! I haven't made scrambled eggs for so long, and I love them too! You are right about stopping and seeing the moment, I really need to do that more. I thought of you when I read this from Ruth Reichl 🙂 tried it last week and am converted. Hi Rosa! I love them too…I'm ecstatic that I found this recipe! Hi Jessica! That sounds heavenly…both the eggs and your husband making your breakfast! Hi Anh! When I was working in Europe the train was my pause moment too! My name is Luke. I’m a student at Harvard Business School and am working on an idea for a business with Ferran Adria’s ElBulliFoundation. I’m reaching out to you because I’d love to speak with you to get your perspective as a food blogger and amateur chef. Basically, the ElBulliFoundation (what has grown out of Ferran’s successful, but now closed restaurant), is looking for ways it can help and inspire those interested in food and creative cuisine (like food bloggers and amateur chefs) with the work they do. I’m looking to know what, if anything, would be interesting to people like you. Should they set up a blog? A sort of facebook for food lovers? A youtube channel with instructional videos? Something more? So, I’d love to speak with you about why you food blog, why you cook, what you enjoy about those activities, and what sort of other online sites, books, stores, etc you visit/think about. And then what, if anything you might think would be cool that Ferran Adria / ElBulli could do to inspire you. PS. I'd be happy to speak with others who might read this comment to, if you blog about food, just read lots of food blogs, and/or love cooking. omg, am in love in scrumbled eggs! Hey Joey! As a food lover esp. BACON in any form…you have to try making BACON SALT!…if you can get applewood smoked bacon, low sodium…much better or DOUBLE SMOKED BACON ( my boys prefer Tiroler Bacon). I crisp them up in the microwave just like my boys do..over paper towels, then when cool enough to handle, break into pieces and blitz in food processor till finely ground together with coarse sea salt! That's it!!! I sprinkle it on everything from salads to sunny side up eggs to scones, etc. I know I can buy them at specialty sotres but I am not going to pay over $5 for a 30 gm. package. For a little over $5, I can buy a WHOLE POUND OF APPLEWOOD SMOKED BACON PACK!!!! Since you put in a pinch of rocksalt already, does the butter have to be unsalted? This sounds like Mark Bittman's recipe for weekend scrambled eggs. I have to try it this way — you know that I love the fact that it has all that butter! 😀 I know that this method takes a while longer than the usual scrambled eggs. How long did it take to make? Also, believe it or not, I don't have a saucepan! I have a nonstick frying pan, a wok, and a steel pot. Which should I use, or does it really have to be a saucepan? Great reminder of how yummy just EGGS and BUTTER really are! I thought this was a foreign blog until I got to the pan de sal part. Amazing how something so simple can be so drool-worthy. the picture alone makes me drool, will try this one. Hi Luke…will send you an email! Hi Betty Q! I wish I had access to that bacon! I would love to try my hand at making bacon salt…you know I am a big fan of bacon-anything! Hi Kaoko! Believe me…I too sighed when I took my first bite! Hi Kath! I use unsalted butter but go ahead and use salted and just use less salt 🙂 Enjoy! Hi Katrina! Mine took shorter than the original recipe, as Ruth Reichl herself mentions (that it can take shorter than original cooking time)…you can use the smallest pan of the three 🙂 Hope you liked it! Hi Bom! Sometimes it’s the simplest things that are the best! I made this yesterday, and, although I made a mistake and the pan was too hot in the beginning, I was sort of able to rectify it before it was too late. I'm sure it can still be better, but for now, it is the best scrambled eggs *I've* ever made! 🙂 And to think, it didn't even have any milk or cream, as Mark Bittman's recipe does — but I did put a ton of butter. 😀 Thanks, Joey!!! You have captured the few simple moment to perfection and I think have given voice to many of our thoughts:) the shower- yes hard piercing shower is what I need.the kind that hurts and the tingle remains even after. The egg is bliss; on a lazy saturday morning lost in the stirring cooking for my family. Lovely. and literally picture perfect. Oh! So delicious-looking. I gotta try making it this way. Thanks for the recipe! O yes a good long shower will do that for me too! We do own a bathtub but never really use it. A shower for me is a lot better! As for these gorgeous eggs. I still need to make dinner and am considering making these instead! Eggs and butter. Simple luxury. 🙂 By the way, where would you recommend good pan de sal. i have not been so inspired with the ones i tried here in the metro. sigh. Hi Soma! These moments are so important don’t you think? And they do make a big difference if you allow them to 🙂 Stirring the egg on a lazy Saturday morning…perfect! Hi Shalum! Yes, such a luxury for the price of two simple ingredients! I have not ever found a pan de sal I like as much as the ones I had when I was younger and we had an old pan de sal vendor come deliver it on his bicycle…the whole wheat ones here we got from the Salcedo Market, from the stall that sells the bagels and all the whole wheat bread products. It used to be the NY Bagel company but now they go by a different name. Although we like them, they are not like the old traditional pan de sal of my childhood…that I am still in search for! Hi Redmenace! It really is quite brilliant…I am so happy I came across it! Hi Katiez! Oooh! Yogurt sounds like a good idea…will give that a whirl next time! Hi love cooking! Sometimes the simplest things, prepared with care, are the best! my pause button is the same as yours. long bath or shower. and i love shower gels. eggs are my comfort food and im very picky on how my eggs are cooked. just recently i discovered how the french cook their scramble eggs thru laura calder (i adore her!). just eggs and butter and salt. nothing else. i think it's the same as your scramble eggs except she separates the yolk from the whites. i tried her method and i never look at scramble eggs the same way. i tried cooking the eggs on a sauce pan as she recommends but cleaning the pan with those sticky eggs is such a hassle so i tried with nonstick pan and still works. though you really have to be careful with the fire. it has to be on the lowest possible setting of your stove. I made these scambled eggs this morning and they were wonderful, so simple too. I have been trying to make the perfect scrambled egg forever, thanks for the recipe. I can't tell you how long I've been trying to make the perfect scrambled egg. My daughters will be so happy with this! These eggs look amazing and I really enjoyed reading your post. Focus on the eggs, brilliant! scrambled eggs and great writing. what else does one want? I live in the middle of Tempe AZ but we are lucky to have Agriculture zoned land among regular housing. I contribute my land to a Lady that loves to raise Horses and chickens. They are feed the best organic food/grains and eat lots of bugs and have 2 acres to run.. So, me and my neighbors get the best eggs in the world. The egg yolks are not yellow like even free-range or Omega, etc but are Orange and when boiled, the yolks are heavy and thick. My Cardiologist has said new science is eggs are safe even for heart patients like me. I tell my friends not to buy reg coop raised chicken but they are not convinced until I give them a dozen. We have been conditioned by the Agra-business to accept poor replacement for profits. So, go to the best Organic Food store or your Farmers Market and give yourself a break.